Life is in the clouds; great life, broad life, deep life, elevated life. There are multiple different choice of activation functions for a NN. Many work has shown that using Rectified linear unit (ReLU) helps improve discriminative performance. 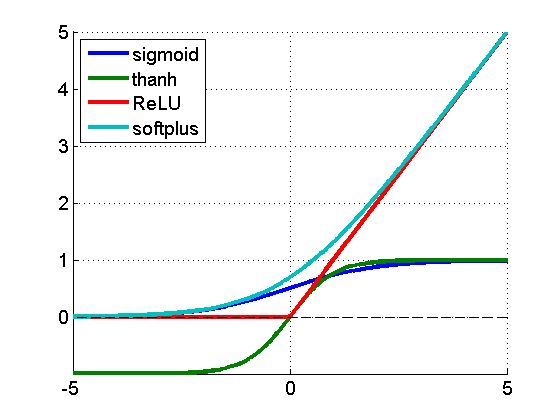 The figure below shows few popular activation functions, including sigmoid, and tanh. sigmoid: g(x) = 1 /(1+exp(-1)). The derivative of sigmoid function g'(x) = (1-g(x))g(x). The derivative of hard ReLU is constant over two ranges x<0 and x>=0, for x>0, g’=1, and x<0, g’=0. Hard ReLU is naturally enforcing sparsity. The derivative of ReLU is constant, as compared to sigmoid function, for which the derivative dies out if we either increase x or decrease x. Professional Women Network Nice forum of discussing professional career development especially for women.